'Game of Thrones' Season Five Finale Recap: "Mother's Mercy"
After what seemed like a very short nine weeks, we’ve arrived at episode 10, the finale for HBO’s Game of Thrones, season 5 and I don’t think I’m alone when I say, I want some answers! Let’s start with the leading contender for Worst. Father. Ever. Stannis (Stephen Dillane), you’ve got some ‘spainin’ to do! If you live to be a thousand, rule with wisdom and humility, and dedicate your free time to finding a cure for Gray Scale, I don’t know if you can ever truly “redeem” yourself, but you are one of the few who get what “Winter is Coming” actually means and how terrible a threat the White Walkers are to everyone in the Seven Kingdoms, not just the Free Folk or those who live in the North. Your faith in the Lord of Light might not be as strong as you profess to keep the Red Witch (Carice van Houten) happy, despite her earlier successes (the death of your little brother Renly being the most impressive), but by cracky you need to make sure that Princess Shireen the Sweet and Innocent did not die in vain. Save the realm! Make it count! On to the Mother of Dragons. Riding off into the sunset on the back of Drogon was a big moment and made for great TV, but what does it really mean for you and your future, Daenerys (Emilia Clarke)? Your other two “children,” Rhaegal and Viserion, are still locked up. (Have you forgotten about them?) And how long are you planning to stay in Meereen? You no longer have to worry about that pesky political marriage and looks to me like you may have worn out your welcome in that little corner of the world. Wasn’t there a throne waiting somewhere that you wanted to sit on? Take your toy-boy, Daario Naharis (Michiel Huisman), and hit the road. What about you, Arya (Maisie Williams)? Now that you’ve found Public Enemy #2 on your Most Wanted List, Meryn Trant (We all know that Cersei is still top of the charts, even though Trant started it all), will you give up on your dream of becoming a professional assassin, a Faceless “Man” as it were? Or will you be swayed by your own thirst for revenge? It would seem that your mentor, Jaqen H’ghar (Tom Wlaschiha), wants the former, but does he really? Does he know you better than you know yourself? Personally, I’m torn. If ever a man needed killing (and frankly, there are quite a few on this show that fit into this category), it would certainly be Meryn Trant (Ian Beattie). In the short term, this would definitely be sweetly poetic justice for you to kill the man who killed the man who taught you how to use a sword, but long term, you might miss your calling. It’s a conundrum. By the way Arya, between you and me, your big sister Sansa could probably use the skills of a good assassin right about now. Let’s hope Brienne’s (Gwendoline Christie) season on the sidelines ends with at least one Bolton writhing in pain at the end of her sword. Finally, what’s going to happen up at The Wall? I’m worried about you, Jon Snow (Kit Harington). It does not look like you are going to be allowed to learn all of the things you need to in order to become a great High Commander. Things are coming to a boil too quickly. Alliser Thorne (Owen Teale) is just looking for a way to take the position away plus you’ve got your squire Olly (Brenock O’Connor) possibly planning a bit of betrayal and if that weren’t enough to worry about, the Night’s King and the whole White Walker army are bearing down on you. That’s a lot and after nearly five complete seasons I know the twisted minds behind Game of Thrones well enough to know that I’ll be left agog, aghast, and probably shaking my fist at the answers (or lack thereof) for these questions, so I guess we best just get down to it. 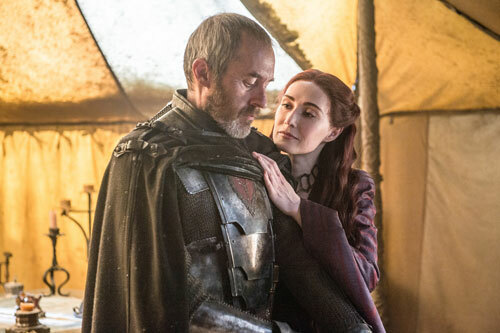 Tonight’s episode is called “Mother’s Mercy”: Stannis marches. Dany is surrounded by strangers. 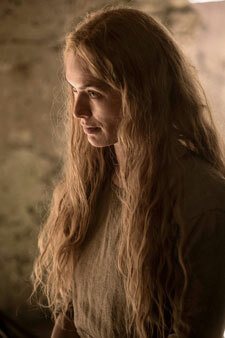 Cersei seeks forgiveness. Jon is challenged. Understatements all, I’m sure. We open in Stannis the Daughter Killer’s camp. Melisandre sees dripping icicles and thinks the thaw is a sign that the Lord of Light is granting the wish Stannis made when he sacrificed his daughter. Stannis is so over her though. The next moment, one of his soldiers is informing him that nearly ½ of his men (and all of the horses) have mutinied. A moment later, another comes to tell him that that’s not the really bad news. He leads him to a clearing where Queen Selyse (Tara Fitzgerald) is hanging from a tree. Another tells him that Melisandre was just seen riding out of camp. Pffft. Yeah you better run. Shaken but undeterred, despite all of his plans simultaneously going to sh*t, Stannis means to go ahead with the march to Winterfell. 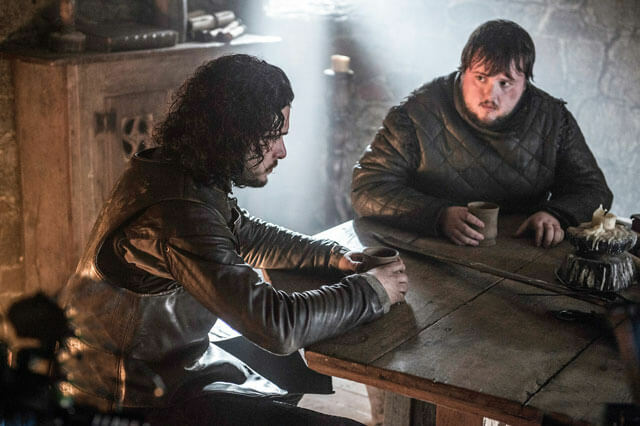 At the Wall, Jon is telling Sam (John Bradley) about the battle of Hardhome, their futile efforts and his current troubles with the men of the Night’s Watch. “How’s it feel to be friends with the most hated man in Castle Black?” he asks Sam. Sam tries to laugh it off, reminding his friend that he was “friends with me” when the situations were reversed. But on a more serious note, Sam wants to leave the Night’s Watch to take Gilly and the baby to Old Town where he can become a Maester and ”really be of use” to Jon. He thinks Gilly and the baby will die if they stay and he’ll die trying to protect her. Jon guesses that Sam has “very carefully” broken his vows and not very surprisingly, he’s happy for him. He lets Sam and his “family” leave Castle Black. Stannis and what’s left of his army reach the outskirts of Winterfell. Inside, Sansa (Sophie Turner) unlocks her room, trying to get to the tower to light the candle the old woman told her about. Of course she drops the key she picked up a few episodes back (the better for Ramsey to find and punish her for, unless I miss my guess). We see Pod (Daniel Portman) on a hill watching Stannis’ army approach. He informs Brienne (who is still watching Winterfell from afar). As Sansa goes to the tower, Brienne senses it’s finally time to make her move. Stannis is still planning a siege with his rag-tag army when the Boltons’ massive army rides out to meet them. Where the hell did all of those men come from? Oh wait, it’s the horses and men that turned on him! From the tower, Sansa watches the battle as her hope once more ebbs away. Cut to Ramsey being Ramsey (Iwan Rheon), piking survivors of the battle. WTH?? Is Stannis the latest major cast casualty or not?? I’m betting yes. Sansa, meanwhile is trying to get away and runs into Myranda (Charlotte Hope), who is pointing a bow at her. Sansa, head held high, basically says go ahead, “If I’m going to die, let it be while there’s still some of me left.” After a truly vile speech about Ramsey’s plans for Sansa’s parts, Reek (Alfie Allen) has finally, FINALLY, had enough. Just as Sansa’s about to be arrowed, Reek acts and tosses Myranda over the balustrade. Next thing we know, Theon and Sansa are leaping from the top of the wall! Wait…what? Leaping? Leaping to where? I don’t remember a moat or any other body of water near Winterfell. Perhaps a stray pile of leaves? A conveniently located wagon full of hay? We’ll find out next year. Oh Meryn Trant must die! In Braavos, we’re back at the brothel where Ser Meryn is beating little girls with a cane and then his fists. Someone stop him! Oh my god! It’s Arya who leaps up and stabs him in the eye with a very sharp blade. She stabs him in the other eye then cuts his tongue out, stabs him many more times then finally for the coup de grace, slices his throat, making sure he knows who she is and exactly who he is. Damn. Uh oh, Jaqen is not pleased. “The girl has taken a life. The wrong life… That man was not yours to take. The girl stole from the Many Faced God. A Debt is owed. Only death can pay for life.” We think he’s going to kill Arya, but Jaqen drinks the poison! Arya is distraught, crying that Jaqen was her friend. The other assassin-in-training, who doesn’t like Arya in the first place and has been waiting all season to be proved right about her, says no he wasn’t, he was no one. From behind her Jaqen’s voice confirms this point. As she watches Jaqen’s face on the body at her feet changes. The last face she sees is her own. Then she can’t see anything!! What? Arya is blind. Guess she needs a new career goal. What good is a blind assassin? Let’s hope that here endeth the lesson and by next season Jaqen will have reconsidered Arya’s punishment. Myrcella (Nell Tiger Free) and Trystane (Toby Sebastian) are leaving Dorne. Ellaria (Indira Varma), still with the contrite act, actually kisses her goodbye and wishes her well. Oh yeah, like I believe that. Tyene (Rosabell Laurenti Sellers) wishes Bronn a fond farewell. On board the ship, Jaime (Nikolaj Coster-Waldau) tells Myrcella that her mother misses her and he’s glad Trystane is coming too. He tells her that Cersei will approve of the match. Myrcella, who isn’t as empty-headed as she originally appeared, is skeptical. “There’s something I want to tell you. Something I should have told you long ago,” Jaime says. Oh no he isn’t! He’s about to tell her “we don’t choose whom we love.” Myrcella tells him she knows what he’s trying to say! And she’s okay with him being her father/uncle!! Are you kidding me?? Oh no! Ellaria you she-beast! Remember that little poison trick the Sand Snakes showed Bronn a few weeks ago? Nothing means nothing in the Game of Thrones. Myrcella has collapsed in Jaime’s arms and on the pier, Ellaria wipes the poison from her mouth and drinks the antidote. Prince Doran you’d better do something about this or your late brother’s concubine just started a war. Casualty number four and we still have a half hour to go! 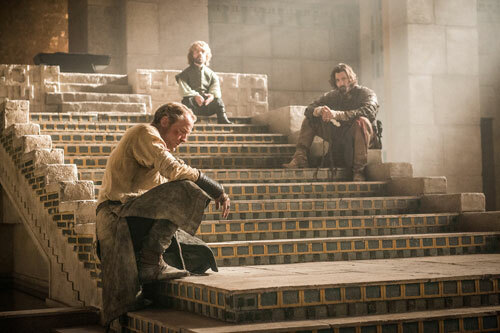 Tyrion (Peter Dinklage) is on the steps of the Pyramid with Jorah (Iain Glen) and Daario. Having no fiancé to tease, Daario’s needling Jorah over his love for Dany. In comes still convalescing Grey Worm (Jacob Anderson) and Missandei (Nathalie Emmanuel). They’re all worried about their Queen. Daario thinks Tyrion, Missandei and Grey Worm should stay in Meereen to keep the peace while he and Jorah take off to search for Dany (and continue their discussion). Tyrion watches them ride out and who shows up but Varys (Conleth Hill), not happy that Tyrion “abandoned” him. But I’m very happy that this team is reunited. So is Tyrion, who is going to need Varys’ words of wisdom. Dany herself is sitting in a boneyard with the remains of the last few dragon meals, with Drogon, who, it turns out is badly wounded. Dany wants him to take her back to Meereen, but he not only doesn’t want to go, he doesn’t want to carry her there. She is suddenly surrounded by thousands of warriors on horseback. Who are they? Dany is sure she’s about to be taken and drops a ring on the ground as a breadcrumb for anyone who comes looking. Atonement apparently involves being scrubbed down while Unella watches. Then her hair is hacked off by a rather dull looking blade. Next, we see Cersei in sack cloth on the steps of the Sept as the High Sparrow address the masses and announces her crimes. “She comes before you with a solemn heart…naked before the eyes of God and Men to make her walk of atonement.” This means walking naked through the crowd while Unella repeats “Shame” over and over and rings a bell. Surrounded by a coterie of branded sparrows, she looks resolute until the citizens begin to shout epithets and throw garbage. Bleeding and covered in muck, she stumbles at the sight of the Red Keep on the hill. Sobbing, she looks completely broken and crying the first real tears we’ve seen from her in quite some time. Inside the walls, Qyburn (Anton Lesser) and Maester Pycell (Julian Glover) are there to greet her. Only her devoted lackey Qyburn speaks. He introduces her to his finished creation, the reanimated Mountain. He may no longer be capable of speech, but he’s sworn to kill every one of Cersei’s enemies. As the armor-clad Mountain picks her up to carry her to Qyburn’s “laboratory,” there is a glint in Cersei’s eye that can only mean one thing. While this was certainly a comeuppance five seasons in the making, she’s not dead and as I always say, if happy Cersei is dangerous, then wounded Cersei is very, very dangerous. After this, I expect bad, very bad things to happen to a great many people. At the Wall, Ser Davos (Liam Cunningham) has arrived to urge Jon to join with Stannis. Melisandre chooses that moment to arrive on horseback. She is not only alone, she looks defeated to say the least. Davos asks about Shireen and then Stannis. Melisandre can’t even speak, but she doesn’t need to. Jon is alone, reading messages from ravens detailing the many catastrophes of the day. Oh crap, it’s Olly with word of Jon’s long presumed dead uncle, Benjen Stark. He and Ser Alliser say Benjen’s alive. Don’t believe them, it’s a trap, I just know it! !